HO/AFP/GETTY IMAGES - This handout image shows a prize-winning, super energy saving LED bulb from the Dutch electronics giant Philips. The 10-watt light bulb, said to last over 20 years, went on sale online and in stores Sunday to coincide with Earth Day. Just in time for Earth Day, Dutch electronics company Philips unveiled a new super energy-efficient light bulb Sunday with a shelf life that should last about 25 years. The catch? It costs about $60, but Philips is said to have forged deals with some stores to bring that cost down to about $20, according to the BBC. Still, that price might be too high for consumers, as VentureBeat has previously pointed out. The new bulbs are made of light emitting diodes (LEDs) that are more energy-efficient than traditional incandescent bulbs, and have same color quality as standard bulbs. LEDs are typically found in TVs, computers, and car headlights. 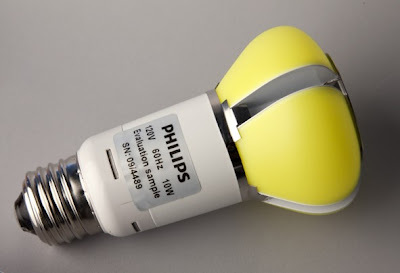 Philip’s new bulb won the Bright Tomorrow competition last year from the U.S. Department of Energy, which asked companies to create an affordable energy-efficient alternative to the standard 60-watt incandescent light bulb. Philip was an easy winner, as the only entrant in the competition. Even at the cheaper $20 price, the new LED lights face heavy competition from the much cheaper compact fluorescent bulbs. The new bulbs hit retail store shelves Sunday.